Despite having a crime plan in place, the crime rates have gone up, but the interim IHA executive director declined to comment on those findings after their public meeting. 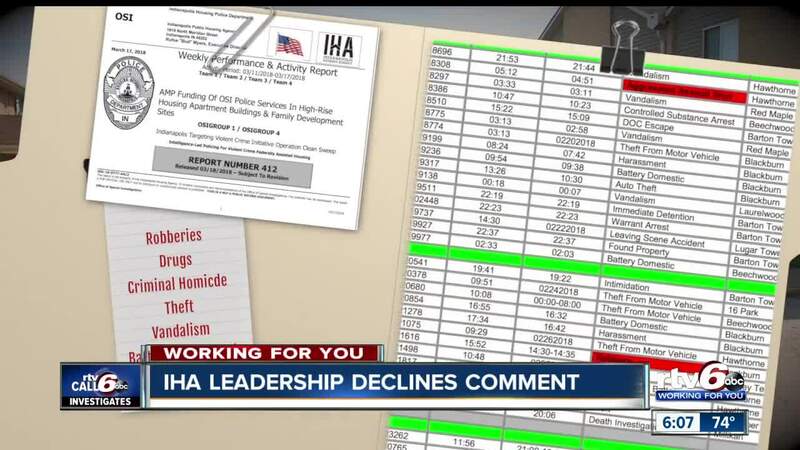 INDIANAPOLIS – Top leaders with the Indianapolis Housing Agency have refused to answer questions about their preparations for the pending audit and ongoing crime increases at IHA communities. Interim Executive Director of the IHA Jennifer Green and IHA Board Chair Christopher Barney had no time for questions when Call 6 Chief Investigator Rafael Sanchez approached them at the end of their public meeting on September 11. Our hope was to get some answers on the upcoming audits, which are set to begin next Tuesday, and the public safety issues that the multi-million dollar taxpayer-funded agency is facing at its 16 communities that are home to more than 22,000 people. 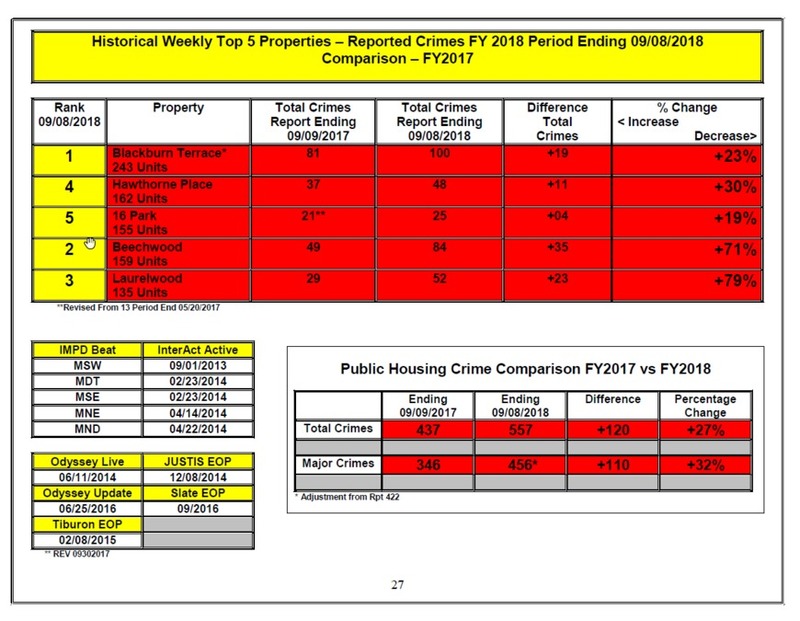 Since May, Call 6 Investigates has obtained internal reports that warn the IHA leadership of the double-digit increase in crime at several communities including Blackburn Terrace, Beechwood, Laurelwood, Hawthorne and 16 Park. The agency did shift some resources to beef up its police presence during the summer months, but that program has ended and had little impact on the crime rate. The agency has not detailed any plan for the remaining four months of the year. In a video that was shared with Call 6, Green alerted employees last week at her first staff meeting not to leak information to the media . At the end of Tuesday’s meeting, Call 6 Investigates’ Rafael Sanchez approached Green and Barney with several questions. Rafael: "Good afternoon. Can we speak with you for a second?" Rafael: "It’s a public meeting. Can we talk you about the upcoming audits? Are you ready for those audits?" Christopher Barney: "Like she said she doesn't have time to speak about it?" Rafael: "How about you Mr. Barney. Your appointed by the Mayor--are you prepared for the audits?" Christopher Barney: "Not at this moment. I appreciate it." Rafael: "You’re not prepared for the audits or to talk to me?" Marc Sultzer: “We won't be making any comments at this time?" Rafael: "Why is that? It's a public meeting. We can't ask what you do? How you run the organization? Should I call the Mayor?" Rafael: "You want me to call the Mayor, sir?" You can watch that exchange in the video player below. Call 6 Investigates did reach out to Mayor Joe Hogsett’s office. Spokesperson Taylor Schaffer released the following statement saying the mayor’s office is focused on identifying new leadership to oversee the organization by the end of the year. IHA Board Chair Christopher Barney was appointed to the board by former Indianapolis Mayor Greg Ballard. Green has been an employee of IHA for a decade.